You all know Steve Wozniak. If you're using a computer today is partly because this man created some really awesome things. You know, like changing the world with the other Steve. He's here now to answer your questions about what made him take his path. I enjoyed early electronic kits with buttons and buzzers but that was a mild start which could have gone in other directions. Science fair projects in elementary school, really solidified my direction. A couple of simple projects, a flashlight apparatus with rubber bands instead of solder, and an electrolysis project were also not determining of my real interest. But I found a journal in a hall closet with descriptions of binary numbering and logic gates and storage devices. When I discovered that a 9-year old could understand this stuff, I knew it would be my passion forever. I didn't think there were jobs in computers but I would love them as a pastime. This interest was solidified by large construction projects (ham radio transmitter and receiver from kits after learning and getting my license), atomic electron orbital display (92 lights, 92 switches, tons of relays, some diodes for logic), a tic-tac-toe computer (about 100 transistor circuits for rules that I made from playing games, although later in life I minimized it to about 10-20 rules for simplicity), a 10-bit binary adder-subtractor. In no case did I copy existing logic or circuits and that forced me to learn it all well. In high school I got to program a computer and came across a manual for an existing minicomputer. I took my elementary school logic experience and tried to teach myself how to design a computer, given its architecture. I had no books on how to do this. I shut my door and worked alone. After a few tries over months, I had a pretty decent design with the chips of the day. Then I started designing every minicomputer made. I'd design them over and over, making a game to save parts. I had no books but came up with good techniques because it was for myself. The Data General NOVA came out and had a very different architecture which wound up taking half as many chips, due to being designed around available parts very well. it was a very structured architecture. I told my dad I'd someday have a 4K NOVA (enough for a programming language). He said it cost as much as a house down payment. Throwing down the gauntlet, I countered that I'd live in an apartment. The day I discovered that microprocessors were much like these minicomputers I'd designed back in high school, the formula for an affordable 4KB computer popped into my head instantly, remembering my old goal. Thankfully I'd been through a lot of stages leading up to this, building games around my TV (the only free output device) and terminals for the Arpanet. You do a lot when you love electronics and have little chance of ever having a girlfriend or wife. 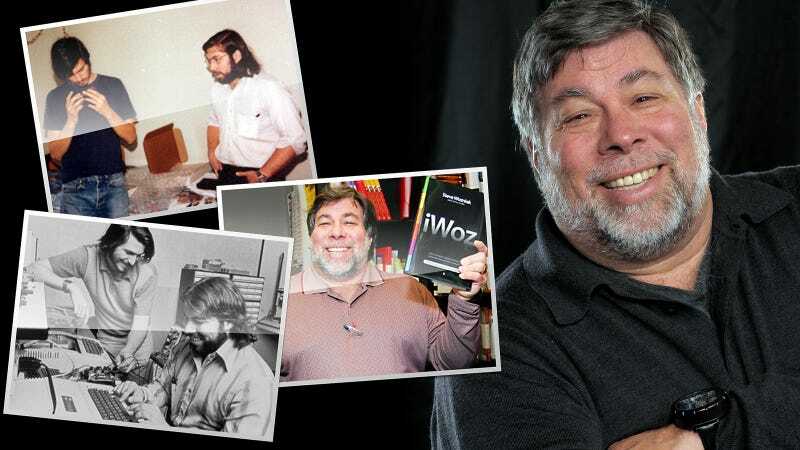 Something you want to ask Woz? He's here-live in the discussion section taking your questions. What Was It is a series of short interviews co-hosted on Gizmodo and io9 that asks the luminaries of science and technology what inspired them.